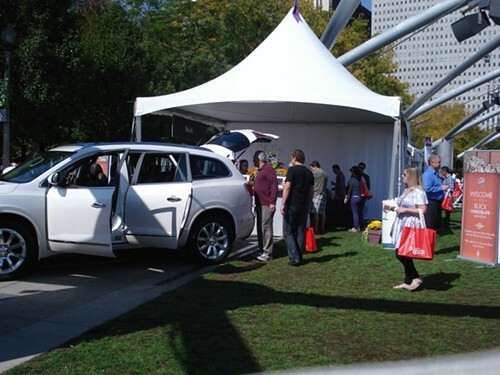 It's always been much easier to drink than eat at the Illinois Restaurant Association's Chicago Gourmet. 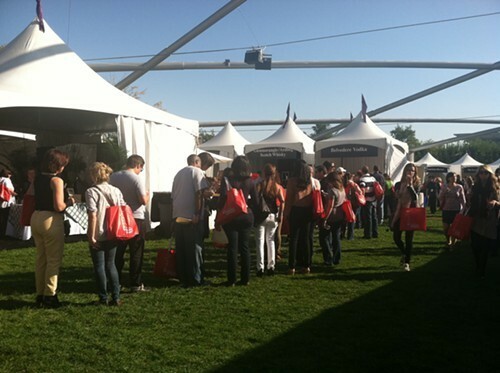 The first year, you could stand in line for 20 minutes for a single bite of food, but there was never any wait at the wine tents. 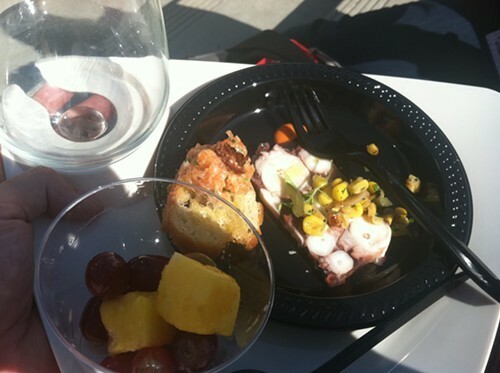 The event has improved exponentially in the four years since then—for one thing, restaurants are now grouped into "tasting pavilions," so you can get three or four small plates at a time, and the lines generally move pretty fast. Still, there's always a line for food, and very rarely any wait for wine or other alcohol. So this year, I decided to focus on the booze (with some food thrown in for good measure). After the jump, photos and some commentary. The Good: Pretty much everything I tried at the Grand Cru tasting (for those without a press pass, that's another $175 on top of the entry fee of $170 per day). Casa Dragones is a young tequila blended with a five-year extra añejo; it tasted light and almost sweet, with clear agave notes. It's very easy to sip, but also carries a price tag of more than $250 a bottle, so I don't think I'll be buying it anytime soon. That's probably true of everything at the Grand Cru tasting, but in this case the bottle is made out of crystal, suggesting it's not really aimed at low-rollers like me anyway. All the Far Niente wines were excellent, but I was especially impressed by the chardonnay. And the 18-year and 25-year Laphroaig single malt scotches were easy to drink despite their intensity. I thought the 18-year was peaty until I ventured out to the Whiskies of the World tent to try the 10-year, which is even smokier. 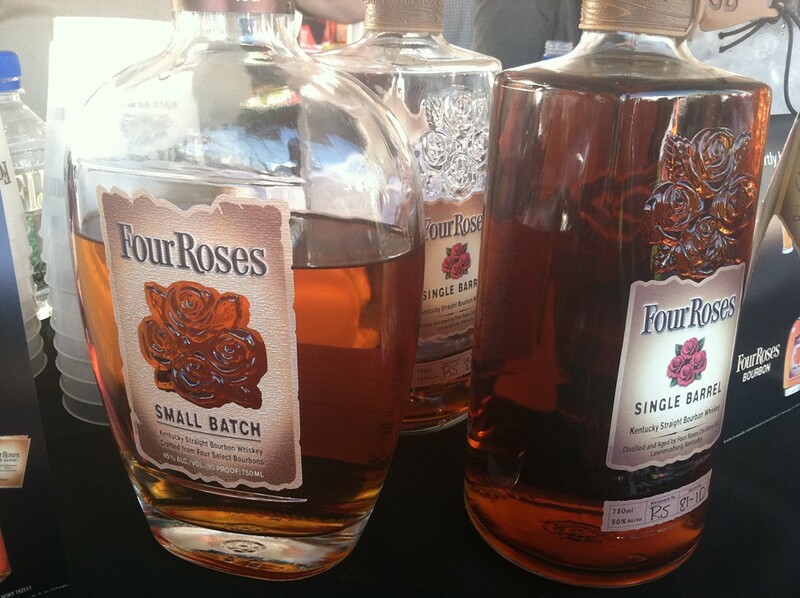 I'm a little surprised that I could still taste anything after all that peat, but I also really enjoyed the Four Roses single barrel bourbon. 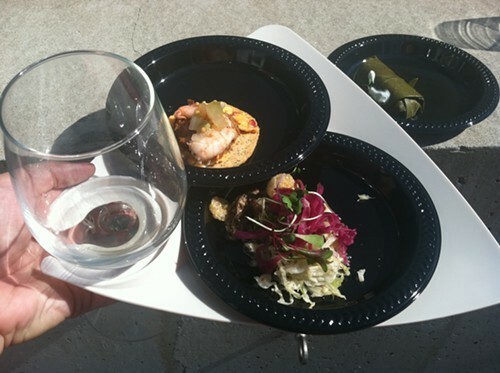 The single biggest improvement over previous Chicago Gourmets was the inclusion of these little tasting trays, which made it infinitely easier to juggle multiple plates and a wine glass. The food on it wasn't bad either: I liked the braised goat neck with chicharrones from Henri and the Gage more than I expected, but the standout was Big Jones's cracker with pimiento cheese, andouille sausage, pickled shrimp, an unlikely sounding combination that turned out to work. 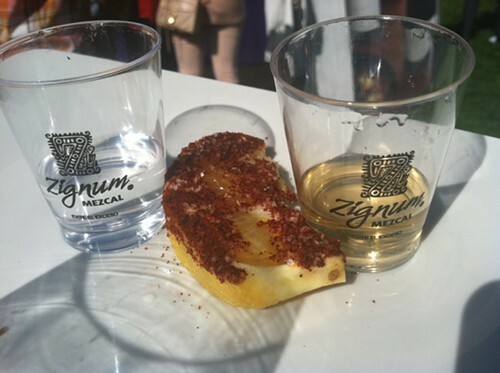 The Bad: I was excited to hear that a mezcal that's launching soon in Chicago would be at the event; I've been a fan of the spirit, made from the heart of the maguey plant, since the Spirits of Mexico festival. It's traditionally made by small-scale producers in Oaxacan villages, usually from piñas (maguey hearts) roasted in a pit for several days, which gives the alcohol a smoky flavor. Zignum, on the other hand, is made by the Coca-Cola company, which has chosen to steam the piñas instead of roasting them, thus eliminating the smokiness. To be fair, it's not actually bad—it's light, sweet, and much less rough-tasting than traditional mezcal—but I can't say it's particularly good either. It definitely lacks character. And I have trouble getting behind a mezcal made by Coca-Cola. 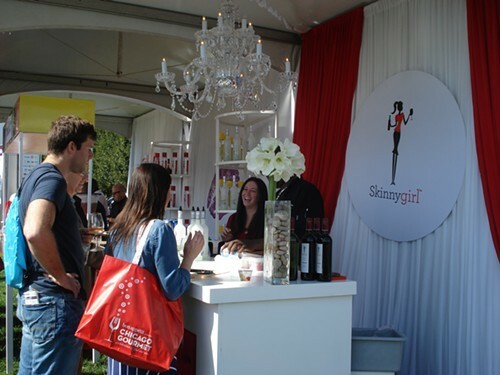 I'm sure plenty of the Chicago Gourmet attendees were the target audience for Skinnygirl cocktails, but I tend to cringe when I'm informed of the calorie content of my cocktail. Then I cringe even more when I taste it and discover it's terrible, with flavors of artificial sweetener and not much else. Normally I wouldn't go near something like this, but I noticed the booth, complete with chandelier, and wanted to make fun of it, but figured I should at least give it a chance first. Which brings me to the final category . . . The bizarre: "Bizarre" might be overstating it a bit, but these are the things that seemed a little odd to me. 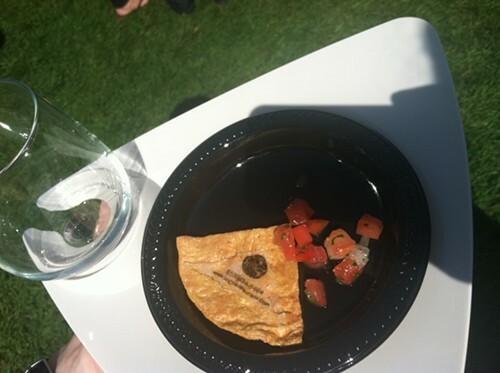 For example: a tortilla chip from Moto that doubles as a business card. (We wondered why there was no line for Pavilion 2, and it turned out to be because the only thing being served there was a chip with salsa.) Homaro Cantu is sure proud of his innovative printing technology. Corporate sponsorship seemed a little over the top this year. I counted more than 40 sponsors in the event guide (including the Sun-Times—hey, parent company!) and saw many of them represented in booths scattered around the event. I wanted to hate Target's tent, but it was actually pretty nice—and the boxed wine they were sampling might have been the only wine in the entire place I'm ever likely to buy for myself (the sauvignon blanc isn't bad; the malbec is). Because nothing says "food" like a Buick. Ice sculpture with girls in fur hats. Poor girls. It was 75 degrees, but felt more like 85 in the sun. Some of the longest lines at the event were for the Belvedere vodka booth. Seriously, people? 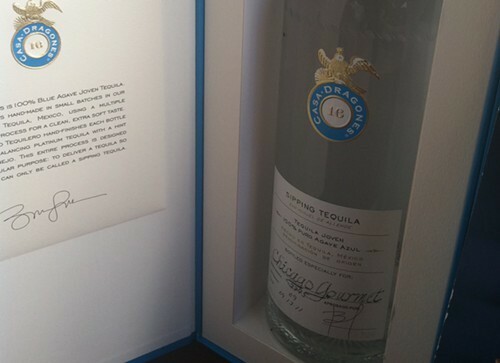 Nothing against vodka (OK, a little against vodka), but there was way more interesting stuff there. Julia Thiel writes about booze every Wednesday.